Welcome to the Porsche Club of America Grand Prix Region website! If you are passionate about Porsche…and want to fully enjoy the experience of owning this fantastic German precision driving machine, we want to get to know you better. So, let’s start by telling you a little about us. The Grand Prix Region (GPX) is one of the 143 regions that make up the Porsche Club of America(PCA) and is one of fourteen regions in Zone 8. We are a region with about 600 members and received our club charter in 1981. 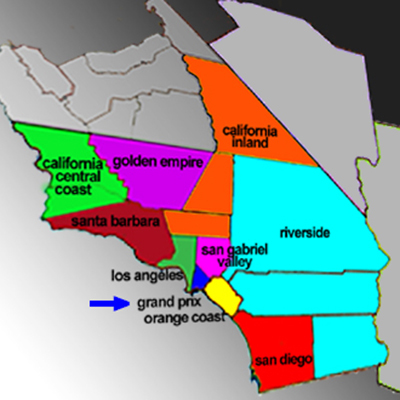 Our geographical area covers the Los Angeles area bound by the I-710 on the west, I-5 on the east, and the Orange County line on the South. The attraction to join GPX are the various activities and its friendly members. Our Region was formed to promote more driving events so that its members can learn to enjoy their Porsche cars the way it was intended to be enjoyed. In fact each year the Grand Prix Region hosts several Driving Events, Autocrosses, Driving Tours, and a Concours d’ Elegance. It’s not always about competition…we also take time to get together to socialize, with events such as the New Member BBQ and our annual Holiday Party. Because we are part of a national club with over 100,000 members, our region members join with other regions in events such as Driver’s Education, Club Racing, and Autocross. We also participate in national PCA events such as Treffen North America and the annual PCA National Porsche Parade. The Grand Prix Region promotes and provides a friendly atmosphere where members can share ideas to make the Porsche ownership an enjoyable experience for all. We welcome all Porsche enthusiasts and encourage all activities that work to achieve our goals. We have several local members who are excellent resources readily available to answer any question you may have about your Porsche. In addition, several local businesses are club sponsors available to provide support for care of member vehicles. At times GPX will host a “Tech Session”. The Tech Sessions usually provide an increased knowledge of Porsche repair and maintenance. On occasion we will host a tech sessions that is not related to Porsches, but the session provides technical knowledge of machinery we often see and wonder about “How does that really work?”. Our Tech Session to L A Helicopter is just one example. Well that’s a bit about us. How about contacting us through this website so we can get to know you better? You can also contact any of our Board Members. GPX truly believes that “It’s not Just the Cars, it’s the People.” So come join us at an event or two…and enjoy the fun! PCA Grand Prix Region shared a post. PCA Grand Prix Region is with Don N. Holthe and Bruce Jephcott. * Featuring 4DR Porsche's in the Cone Zone! Fortunately, our fellow member, Kesse Ho brought his camera and submitted these images. So enjoy and remember our new meeting date is now every "second Saturday" of the month. *Check back often for new events posted here. 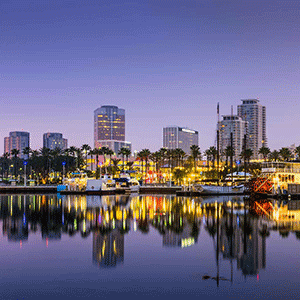 PCA Grand Prix Region is at Acura Grand Prix of Long Beach. PCA Grand Prix Region is with Alan Johnson and 3 others at Circle Porsche. The maintenance of the highest standards of operation and performance of the marque by sharing and exchanging technical and mechanical information. 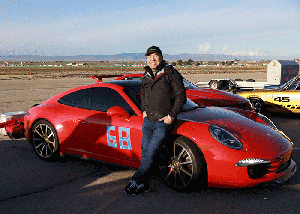 Mutual cooperation with Porsche Club of America, Inc., and with other regions of PCA.